Wesley Curles, a spring 2018 Auburn University Honors College graduate earning a bachelor’s degree in biomedical sciences from the College of Sciences and Mathematics, has been awarded a NCAA Postgraduate Scholarship. 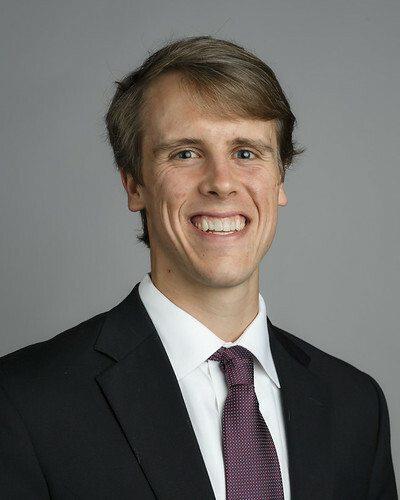 A four-year member of the university’s Division I Track and Field Team, Curles excelled in the classroom with a 3.96 overall grade-point-average, as well as in the lab, where he completed research investigating the link between Alzheimer’s disease and Type 2 diabetes. In addition to his selection as NCAA Postgraduate Scholar, Curles was recognized earlier this year as the men’s 2017-2018 SEC Brad C. Davis Community Service Award recipient. Further, he was a recipient of the Algernon Sydney Sullivan Award presented by Auburn University President Steven Leath. He was named the Phi Kappa Phi Outstanding Senior, and was selected as the 2017-2018 Male Scholar Athlete of the Year at the Spring 2018 Auburn Athletics Banquet. He was also a Rhodes Scholarship nominee in the fall. A member of the U.S. Track and Field and Cross Country Coaches Association Academic All American team and recipient of the Southeastern Conference Honor Roll, Curles was also an Academic Top Tiger, a College of Sciences and Mathematics Freshman and Sophomore Award winner, and a member of the Dean’s List throughout his time at Auburn. Also, for the past two-and-a-half years, he has served as a mentor with Big Brothers Big Sisters of America. Curles plans to pursue medical school at The University of Alabama-Birmingham next month. Established in 1964 to promote and encourage graduate education, the NCAA Postgraduate Scholarship selection criteria include academic performance as measured by overall grade-point-average; performance with distinction as a member of the varsity team in their respective sport; active involvement in institutional and community service; and serving as a role model and student leader. “Wesley is Auburn’s 11th NCAA Postgraduate Scholar to be named since 2011 and the second scholar-athlete to be recognized this academic year by the NCAA following Kasey Cooper’s finalist selection for the Walter Byers Award,” said Paul Harris, Auburn’s associate director for National Prestigious Scholarships. For additional information about the NCAA Postgraduate Scholarship, contact Harris. Wesley Curles, member of Auburn University’s Division I Track and Field Team, awarded a NCAA Postgraduate Scholarship.